Vancouver to Kauai, Hawaii - $306 CAD roundtrip including taxes | new record! There are some flights in late April 2016 from Vancouver to Kauai, Hawaii for $306 CAD roundtrip including taxes. It's not as common to see cheap flights from Vancouver to Kauai (LIH) as it is to Honolulu or Maui. On some dates, the flights are non-stop on the way there, using WestJet, and then use Hawaiian Airlines and United on the way back, with stops in Honolulu and San Francisco. This is a new record for the cheapest flights between Vancouver and Kauai. The previous record was $335 CAD roundtrip, when they dropped 2 years ago. I had the opportunity to visit Kauai at a similar time of year (late April) a few years ago. It was a good time of year to visit, because the whales were still around (but getting ready to leave) and it's one of the drier times of the year (Kauai has a lot of rainy months). Kauai is a true paradise. 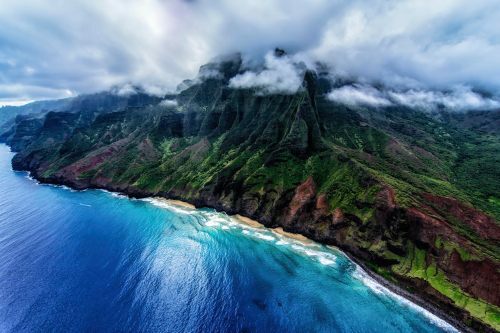 It's the most laid back of the Hawaiian islands, with some great hikes, including the incredibly scenic Na Pali coast. 2. Click on the departure date box to open up the calendar view. 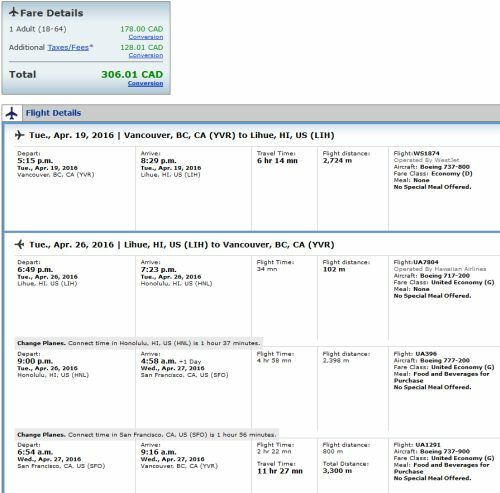 Look for date combinations that work out to $312 CAD roundtrip. 3. Click through from Google Flights to the United website for booking. Even though the booking is made through the United Airlines website, the flight on the way there is operated by WestJet, assuming it's a non-stop flight. vancouver, yvr, flight deals, hawaii, westjet, united states, kauai, lih, united airlines, north america and hawaiian airlines. 3 Responses to "Vancouver to Kauai, Hawaii - $306 CAD roundtrip including taxes | new record! " Booked and booked! Thanks for the heads up as usual! hey im trying to book for in the dates given for 330 and it still coming to 460 Canadian :( please help! Plan to go to Kauai in mid November, hopefully I can see this kind of deal for November trip!